Some weeks ago I was contacted by a doctoral student who is doing her dissertation on MOOCs. She was sending along a questionnaire on how to define and characterize MOOCs to which I had hard times to answer. The reason was not that the questions were specially difficult, but that the answers had very different mileage depending on whether you had in mind cMOOCs or xMOOCs. The feeling was not new: every time I read on the news something about MOOCs or have a conversation among colleagues on the topic, the difference (the huge differences) between the two models make any judgement difficult until some quite major clarifications are made. As the questions from the doctoral student where appropriate, I thought I would take the chance, in answering them, to stress how cMOOCx differ from xMOOCs and, consequently, what a good idea would be to split up one model from the other one. My intention is far from aiming at coining a new term — there already exists even a taxonomy with 8 types of MOOC by Donald Clark — but reflecting on these differences and, in some way, extend the excellent work by Li Yuan, Stephen Powell and Bill Olivier at Beyond MOOCs: Sustainable Online Learning in Institutions . 1. How would you define a MOOC? xMOOCs are self-learning courses supported by a minimum technological infrastructure for the distribution of learning materials and, sometimes, to enable a certain student-to-student interaction. In my opinion, most of them are not much more than that. cMOOCs are self-learning communities, initiated by a person or a group of persons with knowledge and experience on a topic, and addressed to the rest of the community of interest so that new knowledge is built collectively with the support of decentralized leadership and the convergence of ideas. 2. What are the main characteristics of MOOCs? Most xMOOCs are just like an online course but without support or facilitation. Or are just a learning material with, sometimes, a platform for the exchange of opinions and judgements. cMOOCs have a distributed leadership, they use totally decentralized technology and platforms, with a certain or minimum coordination (either methodological or technological) that, once it is established, usually steps aside and out of the front line of the learning action. Most xMOOCs are, in my opinion, a step backwards (or, in the best scenario, just staying in the very same place) in relationship to other learning modalities. Only in very exceptional cases, and compared with very basic modalities, they suppose and advancement if they succeed in creating a dynamic and live learning community. cMOOCs, in my opinion, are a leap forward. They imply putting the student in the centre of the learning action, make them aware and be part of the design and initiative of the learning action, make them reflect about that learning process and about the goals to be achieved (goals that, indeed, they are often changing). The MOOC makes reality the old motto of “learning to learn” as it makes real the creation of communities of learning and/or practice that, luckily, will stay with the learning for a long time (as long as their learning to learn lasts). 4. What would you consider are the main limitations of MOOCs? Most cMOOCs have as a main limitation the lack of facilitation, at least quality facilitation. Which, at its turn, implies other limitations that are the consequence of the former: highest drop out rates, disaffection, insecurity on the accomplishment of the learning goals, etc. A certain level (usually high) of knowledge on the topic to be dealt with. A certain digital competence, the higher the more decentralized is the course. A certain interest in matters of learning methodologies so that they can perform the implicit metaanalysis of a course of this kind. If each and every one of these three factors is already excluding on its own, the confluence of the three of them is quite often an insurmountable barrier. 5. How do you think the main limitations of MOOCs could be addressed? Most xMOOCs, in my opinion, should evolve towards already established modalities which have proven their efficacy, with facilitators that guide the student and scaffold their learning process. cMOOCs should do an effort to increase the granularity of the levels of decentralization, individualization, autonomy, digital competence, pedagogical reflection, etc. so that it is possible to design a gradation of MOOCs that go from less “cMOOC-intensive” (and, thus, closer to more traditional modalities) to more “cMOOC-intensive” levels or “pure-cMOOCs” to benefit from all the possibilities of the model. This granularity with surely imply a trade-off with the “purity” of the MOOC, either with more centralization, more scheduling, more support or facilitation to students, more technological pre-setting, etc. 6. What role do you think MOOCs have? Now focussing only on cMOOCs (I guess it is now clear that I believe that xMOOCs are, in reality, self-learning without a course), in my opinion cMOOCs are the great excuse to rethink the increasingly more blurry frontier between formal education and informal, non-formal and autodidactic learning. And, with it, to rethink the role of traditional educational institutions before the institutions whose mission is not educating, but that in whose performance they end up being excellent learning platforms themselves (firms, among others). (this question is being answered in relationship with cMOOCs, totally leaving xMOOCs aside). MOOCs are an opportunity for lifelong learning. MOOCs can be followed by people from all educational levels. MOOCs participants should have a specific competencial profile (autonomy and initiative, perseverance, certain degree of digital skills…) before taking part in these courses. MOOCs should have mechanisms so that students could be aware of their progress in the acquisition and development of competences. Comptetences acquired and developed in the framework of a MOOC sould be evaluated. Current accredtation of MOOCs is the correct one (free participation + pay per certification). People that have taken part on a MOOC will have more chances of finding a job. 8. Other considerations that you may want to add. I consider essential, in any analysis about MOOCs, to split up cMOOCs from xMOOCs: they are too different to be treated altogether. Regarding the question “Comptetences acquired and developed in the framework of a MOOC sould be evaluated” I do not think this question should be related to any modality of learning action in particular, but related to the purposes that led someone to develop and follow a specific learning action. That is, the decision whether to evaluate lies, in my opinion, outside of the modality, and it is framed in the learner’s context, in the learning goals, in the need (or not) for a certification of such evaluation, etc. Thus, I think this is a question that “does not apply”. The landscape of MOOCs is rapidly evolving. Their horizon is broadening as are the methodologies that lead their design and development… and the business models (or lack of) that lie behind them. Some of them are beginning to be more closed courses than open; some of them are beginning to stress on facilitation; some others on peer-evaluation; etc. By increasing, as I stated before, the granularity of their characteristics, also their types will vary and increase, depending on what characteristics one prioritizes in detriment of other ones. Some of my statements above may thus be very inaccurate in the medium term for most MOOCs, be them xMOOCs or cMOOCs… as I am fully aware that they already are for some. So, the important thing, to me, is the following one: if MOOCs are the answer, what was the question? I think that when trying to understand MOOCs it still is more important to identify the correct question rather than focussing on what MOOCs (all of them or some of them) can or cannot do or achieve. Peña-López, I. 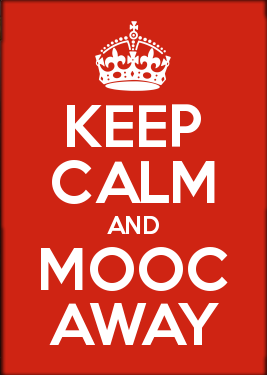 (2014) “MOOCs, cMOOCs and xMOOCs: time to split up” In ICTlogy, #126, March 2014. Barcelona: ICTlogy.